Do you like frozen desserts like ice cream cake? But don’t like the hefty price tag that comes with them? If that’s the case, then you’ve come to the right blog! 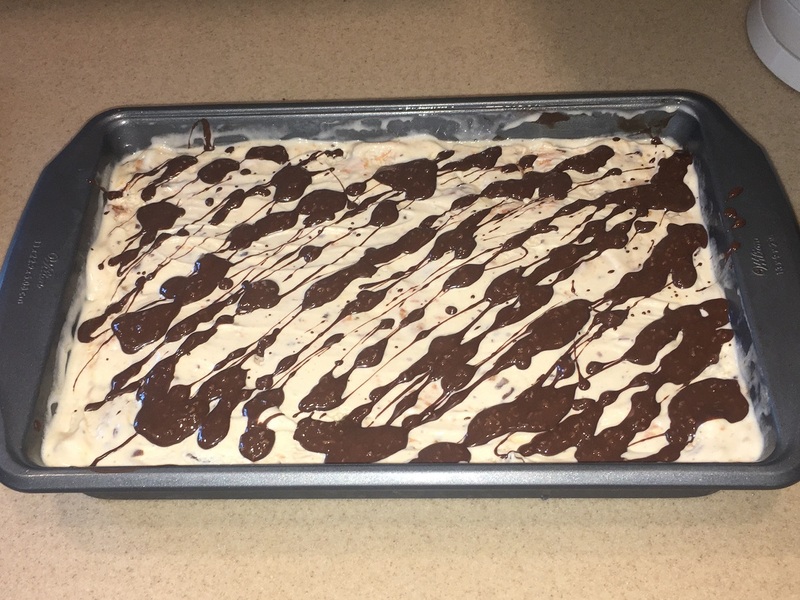 Let me share with you my own ice cream cake – perfected! I originally started making these about 6 years ago. My sister, Hurricane, does NOT like cake. She has always liked ice cream instead. She would ask that we not make her cake, and just buy ice cream for her. Well, I really like to have birthday cakes for my loved ones. So, I decided to check into buying her one. Wow! I didn’t care for how much they cost, so I decided I would try my hand at making one instead! After much searching, and finding different recipes, I decided to combine them into something that would work for Hurricane! It was a HUGE hit. These ice cream cakes are so delicious! My family loves them. I make all the birthday cakes here on the homestead (that’s 14 people). As a matter of fact, they are so delicious I don’t think anyone ever chooses an old fashioned birthday cake any more! Ice Cream Cake – Perfected! The great thing about these cakes is that there are so many different combinations you can make. This recipe is even more versatile than my General Tso’s “Chicken”!! You can choose what kind of Oreos you’d like, what kind of ice cream flavor. And what kind of shell topping – You can even chose whether or not to have the Magic Shell (Lala, that rebel, did just that for her last birthday!). You can choose whatever combination of flavors you’d like to make this cake perfect for you! The crust has taken a few tries to make it perfect! That’s why the oil. The only complaints I’d had prior to the last two cakes I’ve made, was that the crust was just a little too hard. And, I do have to admit, cutting the cake was not as easy as I would like! But not any more! Adding oil make it just a little softer. It’s almost like having a chocolate candy bar for the ice cream cake crust! You can use Magic Shell or, if you’re a rebel like Lala, you can also use regular syrup ice cream topping. I prefer the way the Magic Shell hardens for the middle layer though. Here is a link for making your own homemade Magic Shell! 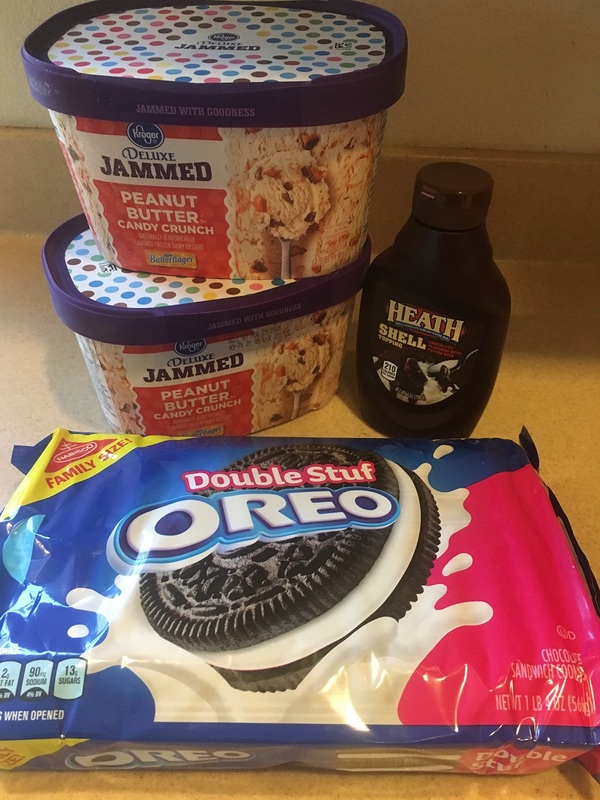 I hope you can use this recipe to make delicious ice cream cakes for your family and maybe even come up with some great new flavor combinations of your own! If you do have some suggestions, please let me know! Blend oreos and oil in a food processor or blender. Pour into 9x13 baking dish and spread evenly to edges, and freeze for 5 minutes. Remove ice cream from carton and cut into four slices. Form and place each piece in pan to completely cover the crust. Drizzle with syrup and spread to cover layer of ice cream, leaving a little to drizzle on top. Drizzle remaining syrup on top. Freeze at least one hour or until ready to serve.